A whole Saturday spent learning about bread at particle level detail, making it and then baking it. It was a great way to spend the day. This day was all thanks to Barm Bakery, and the man behind it Aldo Peternell. He has been obsessing and developing his baking for a number of years, and building up the knowledge he’s been gathering along the way. Quite often it’s only with his friends that he discusses this knowledge with. But it was all thanks to a chance meeting with Laure at a bloggers lunch, and his habit of byob (bringing your own bread), that it was she who convinced him that he should impart this knowledge on fellow foodies by holding a workshop. It was a tight schedule. We were to make and bake 4 loaves in just a day, whilst learning about the how, where, when and why of each process. The loaves we were attempting were a tourte auvergnate, pain de meteil, pain de mie, and a gateau battu if we were lucky. Luckily the levain (or the chef or starter as it is also referred as) was already pre-prepared the night before, or else there would’ve been hours of watching yeast grow. For each loaf, and as in baking in general, exact measuring is important. This ensures reliability and consistency. 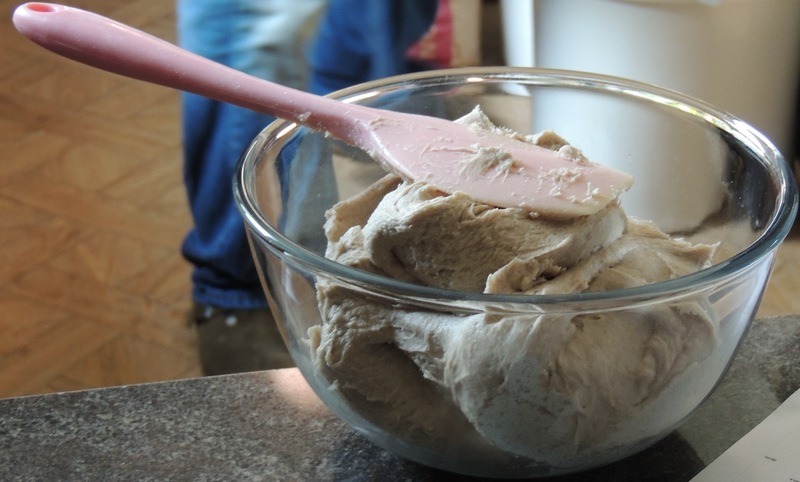 The salt amount effects the colour and gluten development of the dough. The temperature of the water going in effects the natural yeast production, as if it’s too hot or cold then it won’t develop. And you also must keep the temperature of the room where you prove the doughs at a constant temperature. 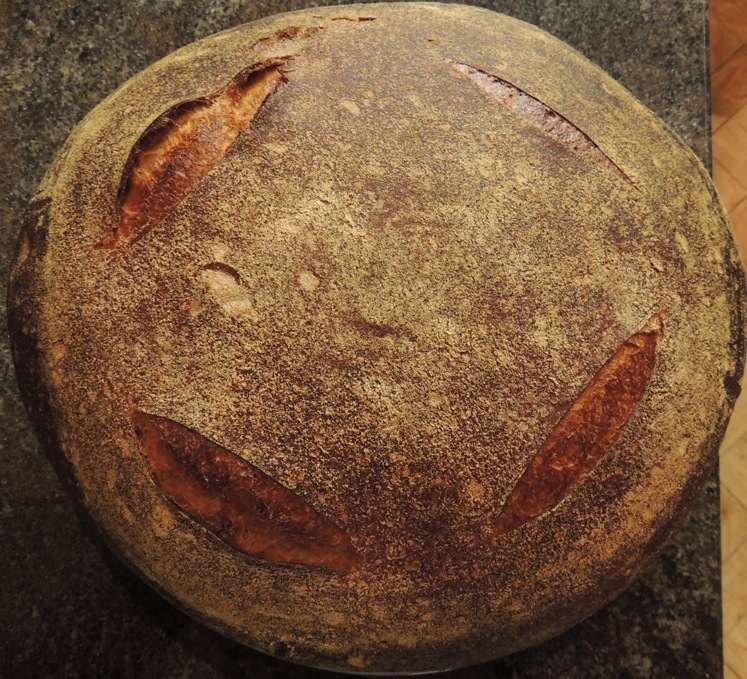 The flours used were all organic, as they contain more natural yeasts, which ensures the bread is naturally levained. You may notice that the bread used is described with a ‘T’ in the front, then a number. This is the continental classification system. The lower the number, the lower the mineral content and the more refined it is. So a T45 flour is generally used in pastries and pasta, whereas a T85 is used for wholemeal breads. 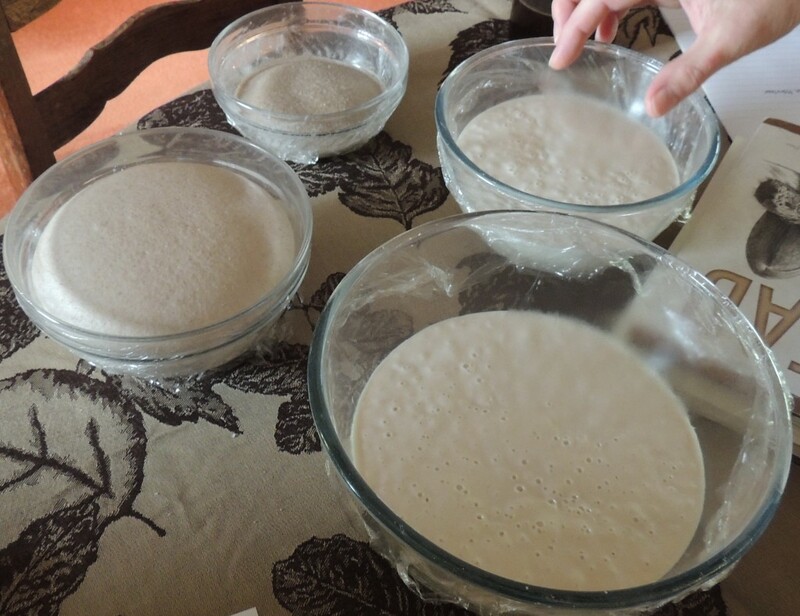 When mixing ingredients, generally the order in which you add the ingredients is: water, salt, flour, then the levain. These were mixed for 10 minutes, fermented for an hour, then folded and prooved in a banneton basket for another 1 3/4 hours. The banneton (or proving) basket supports the dough shape whilst it’s rising. 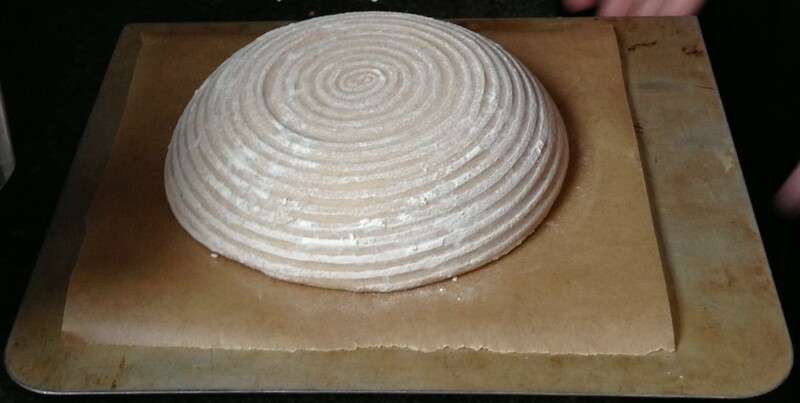 The proved dough is then placed on a baking sheet on a pizza stone in the oven for 25-30 minutes on 230c. A baking dish with water is also placed in the oven to add moisture. 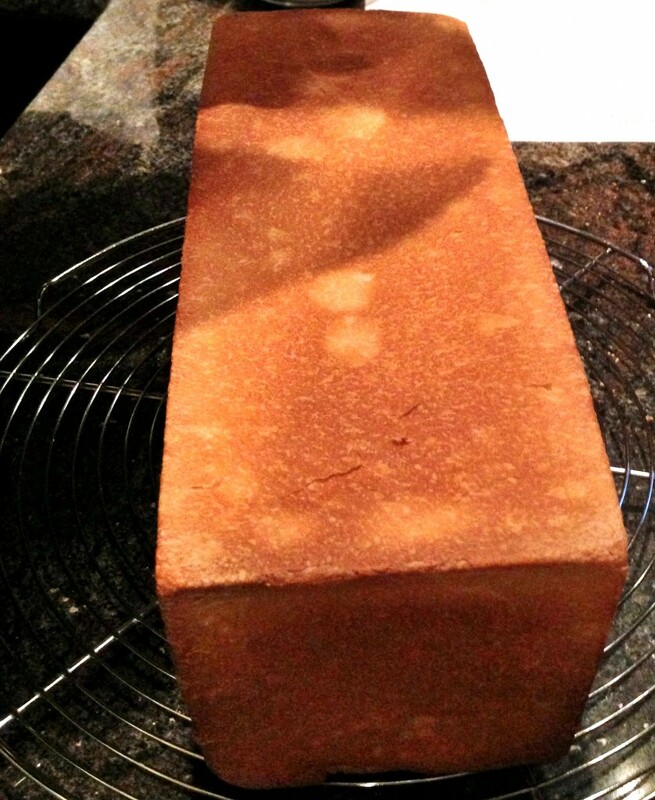 The loaf is ready when it is golden in colour (as shown above), and sounds hollow when you tap the bottom. The process was also the same in the mixing and fermentation. The proving was done in a lined wiker proving basket. It was also scored to control the expansion of the loaf, so it wouldn’t burst in random places whilst rising in the oven. The previous loaves are also described as ‘lean breads’. This means that their main ingredients are flour, water and salt. The two other loaves baked on the day, pain de mie and gateau battu are what are referred to as ‘rich loaves’. These are loaves have also milk, butter and sometimes sugar. They also are made with a higher-extraction flour. In this case a T55 wheat flour. They are also made with fresh yeast, rather than with the sourdough levain used in the previous loaves. 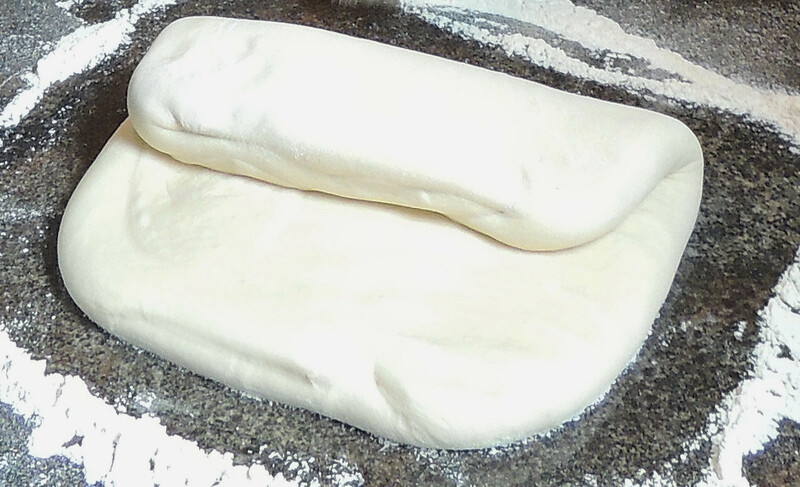 The dough is folded 2 times during fermentation. This removes some of the build up of gasses, which may inhibit the yeast development, and strengthens the gluten. It is then baked in a square tin, with a lid which determines its shape as a square tin. Unfortunately time ran out for my favourite – the gateau battu. This loaf includes around 9 egg yolks, 5 egg whites and a slab of butter. So I guess this was a good thing for my cholesterol. 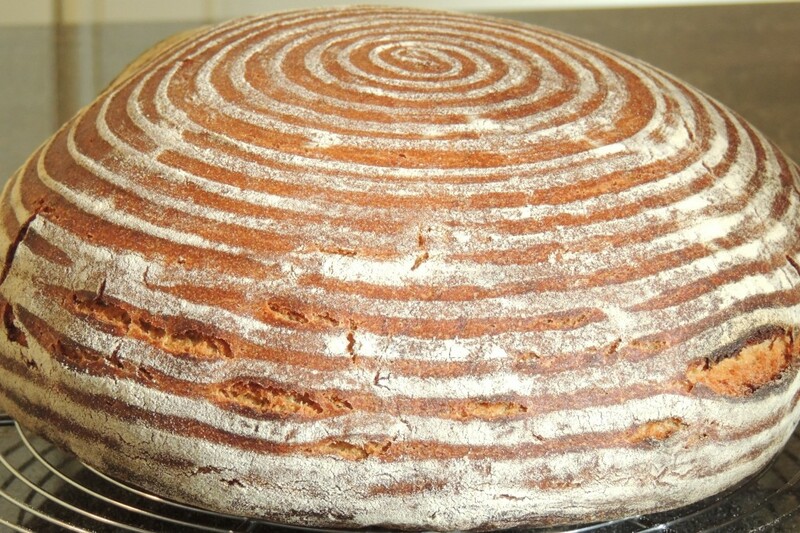 Whilst we were baking the loaves, Aldo also prepared his signature sourdough loaf. I have yet to find any other bread that betters this. Hedone’s bread comes very close, with St. John futher behind. The exact ingredients are a secret, and he’s put in hundreds of hours to perfect this loaf. 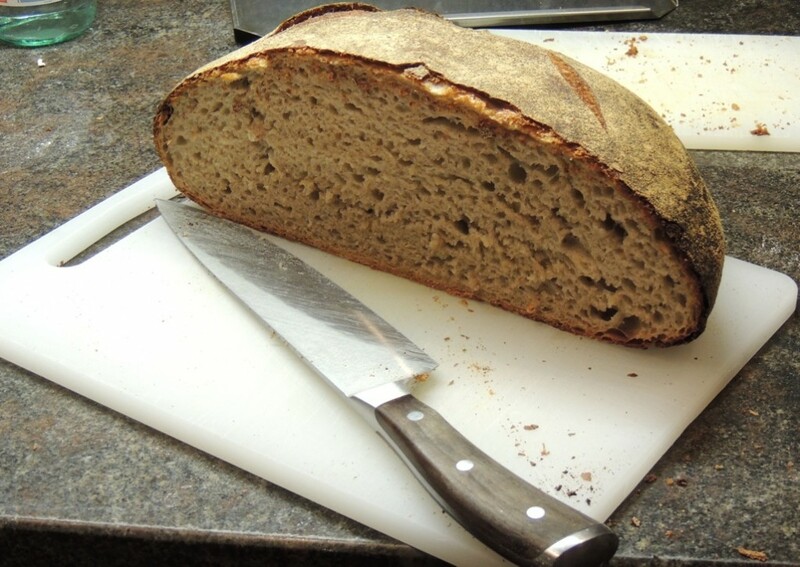 There are plans for future bread workshops in the pipeline. If you are interested in joining in, then please contact me through this blog and I will pass on your details. Nice. 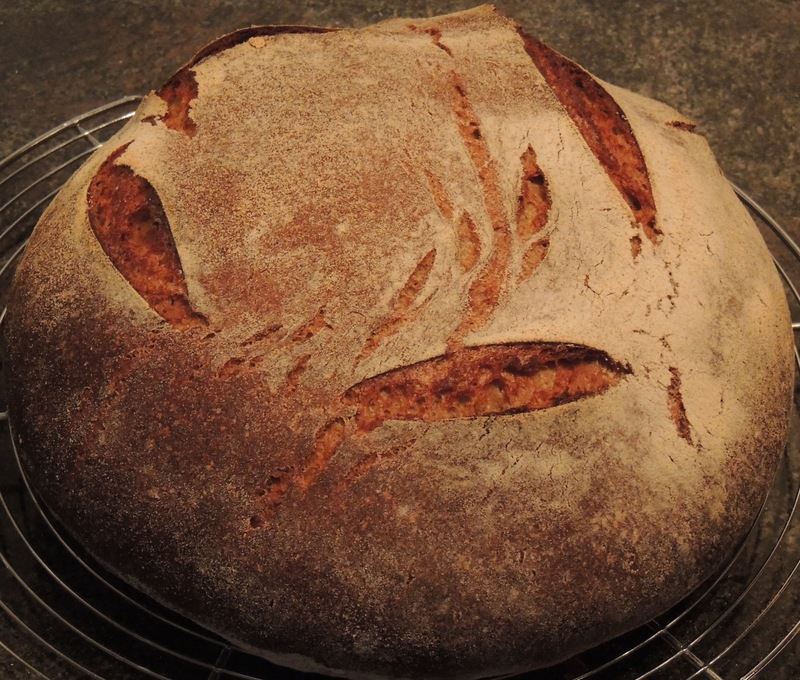 I learnt to bake bread with Virtuous Bread in Hammersmith but have not made any sourdough. That is next on my list.